Google Maps has released a new feature that will turn any car trip into a ride of nostalgia. From Sunday, Kiwis will be able to update the app to include a Mario Kart feature - which will turn the usual location arrow into the '90s video game character. After updating the app, click on the yellow question mark on the bottom right of the screen to use the feature when you're going somewhere. "Just remember to practise safe driving on the road," Google Maps' official blog says. "We don't encourage throwing bananas or red shells at other drivers in real life!" 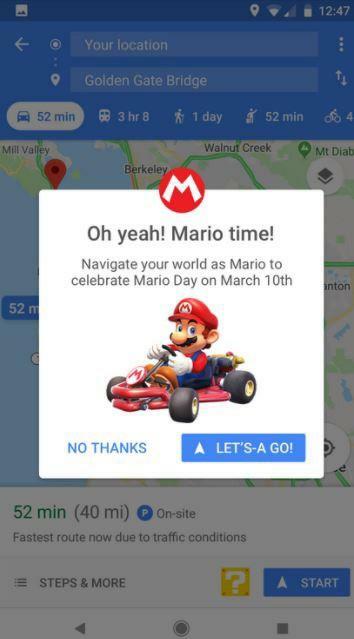 The feature was released to celebrate "MAR10 Day" - March 10. But there's a catch - the feature will only last a week. So make the most of it while you can.